Sogndal Lufthamn Haukåsen can easily be reached from Oslo - or Bergen with Widerøe. After 50 minutes of comfortable flight, you land in the middle of Sogn, on the spectacular Haukåsen, 497 masl. The bike ride along the majestic Sognefjord can start at the airport! Cycle alongside the majestic Sognefjord and experience the unique fjord landscape in the western part of Norway. Steep mountain sides, thundering waterfalls snuggeling up to the narrow and mystical fjord arms. Cycle between idyllic towns and orchards from Vik and Balestrand to Leikanger and Solvorn. 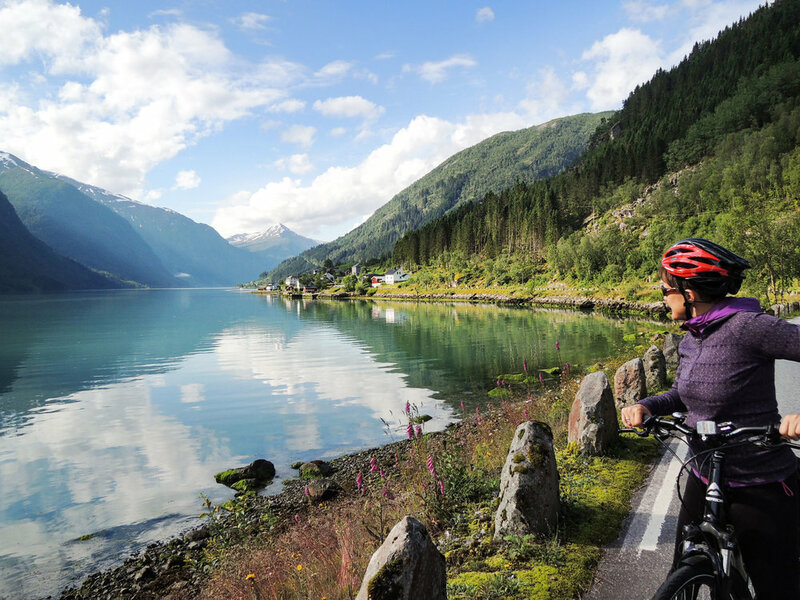 Start your cycling adventure alongside the Sognefjord at Sogndal Airport. The airport is situated with a gorgeous view, high above the fjord landscape and there are multiple departures from Oslo and Bergen each day. From the airport you roll mostly down hill along a narrow road down to Kaupanger. Being an important harbour throughout the ages, Kaupanger has beautiful old farms and a stave church from 1100. Go back in time at Sogn Folk museum and see the “Heiberg Collections”, well worth a visit. Your ride can also start from Vik or Balestrand. From Sogndal Airport it is a 70km drive and a charming ferry crossing to Vangsnes and Vik. The drive to Balestrand is 65 km, taking the same ferry in the other direction to Dragsvik. Starting in Vik gives you the option of experiencing “The silver ring”, a 6km cultural roundtrip jam packed with highlights, before moving on to Balestrand. The whole journey ends in Skjolden, and you can choose between 4-7 days with stages varying between 24 to 78 km. KING OF THE FJORDS - Sognefjorden. Delivery of the bikes in the airport, Vik or Balestrand from 500 NOK pr transport depending on number of bikes. Entrance fees to attractions (churches, museums etc).